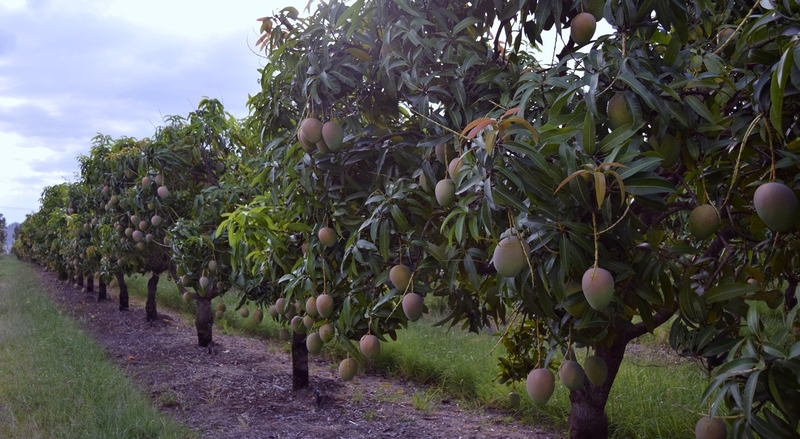 Two North Queensland mango growers contracted to produce specialty Honey Golds for Piñata Farms, are investing in technology, innovation and expansions in their quest to set new quality benchmarks. Mareeba-based Honey Gold Grower of the Year 2018 award winners, Maurice and Madeline Cetinic of Crocodile's Choice and Sam and Kylie Collins of Blushing Acres have implemented significant farm developments to equip their businesses for growth of the specialty line which has approximately a 10 per cent share of the Australian mango market. Crocodile's Choice has some 11,300 Honey Gold trees under cultivation and employs up to 60 seasonal workers during the six-week harvest between December and January. Of its 60 hectares, some 35 hectares are devoted to Honey Golds. The farm also produces Kensington Pride and Keitt mangoes. Owner Maurice Cetinic said Crocodile's Choice was investing in a solid future with Honey Golds after nearly a decade of producing the variety in commercial volumes. "Next season, we'll have two harvesting aids, manufactured in Mareeba at a cost of $400,000, in the orchard. We're hoping to plant an extra 3-4,000 trees in the next two years and, by 2019, we aim to have a fully automated irrigation system. The future's looking bright," he said. This follows a record Australian mango season in which Crocodile's Choice produced approximately 20 per cent more Honey Golds than the previous year. Mr Cetinic attributed this to young trees reaching maturity and favourable growing conditions. Mr Cetinic said he was "chuffed" to receive Piñata Farms' major growing award, announced at the annual Honey Gold Congress in Bundaberg in May. "We planted our first Honey Gold tree in 2002 after we were introduced to the variety by a visiting mango industry spokesman. We were immediately impressed with the variety's attributes including its dark apricot colour and red blush, its firmness, fine texture and distinctive taste. As experienced mango growers, we immediately knew it had legs," Mr Cetinic said. Piñata Farms later bought the rights to the variety and Crocodile's Choice was among the first third-party growers to produce fruit for its first commercial year (2009). "As individual growers, we apply best practice but we also don't leave anything to chance in terms of nutrition, pruning or spraying. We do what we have to do and then some," Mr Cetinic said. "The soil in this region is pretty poor but mangoes seem to love it. Every two weeks we have a pest management scout look over the crop and we follow any recommendations to a tee. "Having a company such as Piñata Farms to market your produce makes all the difference. We love growing mangoes and while we concentrate on growing, Piñata Farms works hard to achieve the highest possible returns. "It's great to know what you're doing is working and that you're at the top of your game. We hope to get close to the mark every season." Some 30 contracted third-party growers were in contention for the award which recognises fruit quality, growing practices, communication and commitment to long-term plans for variety. Blushing Acres was among the first producers in the Mareeba region to adopt optical grading technology and in-line labeling in 2014. Owner Kylie Collins said the grading technology had achieved significant benefits in operational efficiency and product quality and had provided a return on investment in its first year. "The Compac InVision system, made to our specifications in New Zealand, is programmed to look at every part of an individual piece of fruit and reject fruit that doesn't meet customer standards. It also grades for weight and is consistently accurate," Mrs Collins said. "It was a significant investment as we had to extend the shed and set up mirror-image lines to accommodate it. However, the efficiency we've achieved has been worth it. In this past season, we processed 94 per cent premium fruit and our ability to pack more premium fruit increases our returns. The quality of fruit this past season was also spectacular and that was a result of good practices on the farm. "We're also using an in-line labelling machine which labels fruit automatically - and consistently - as presentation with a premium line such as Honey Gold is paramount. "These technologies have saved us five or six people a day (in labelling), and two or three people a day (in grading). We need to 'teach' the software what to look for and we need to train our packing staff to support the technology, but the labour savings have been enormous." Mrs Collins said Blushing Acres also introduced three harvesting aids, manufactured at nearby Tolga last season. "This, along with Sam's attention to detail in the paddock, contributed positively to our high premium pack-out," she said. "If technology can reduce labour and improve our lifestyle, we're all for it." Blushing Acres has approximately 7,000 Honey Gold trees under cultivation. It also produces other Calypso mangoes and avocados, outputting some 48 pallets a day. The family business won the 2017 Honey Gold Grower of the Year award. Piñata Farms is Australia's exclusive producer of specialty Honey Gold mangoes, producing the specialty variety in five states between November and March. The fruit producer is a known industry innovator and technology adopter. Managing director Gavin Scurr said he applauded growers' efforts to adopt technology to improve product outcome where feasible. "Automation needs to be part of farming's future landscape, particularly when Australian labour costs are so high. From automated irrigation to drones to monitor crops, anything that reduces farm inputs is attractive," he said.